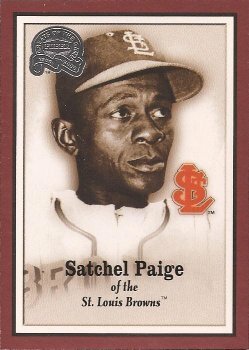 The great Satchel Paige. I think we all know the greatness of Satchel. If not, think of Jamie Moyer, and then multiply by 10. I did a quick search on this card; it's from a 2000 Fleer set called "Greats of the Game". I don't even remember buying this pack. For all I know, this may have been from a repack box of some sort I bought. I have just four cards from the set, but this is by far the best. The design alone wins it for me. A great head shot, simple team logo, gorgeous bronze/burgundy boarder, and no heavy gloss finish. Just the way the player and his team is listed is classy. A lot more newer releases of players from the past should look this beautiful. If anyone sees cards from this set in a dime or quarter box, I will gladly pay you back.